Reach in Closets can be created in rooms that have no closet space at all. 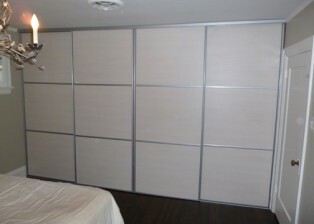 You will need an empty wall and about 2 feet of depth so that doors can be installed. These types of reach in closets are very flexible in terms of their design, you can make them as wide as you like and design the interior cabinetry however you like. 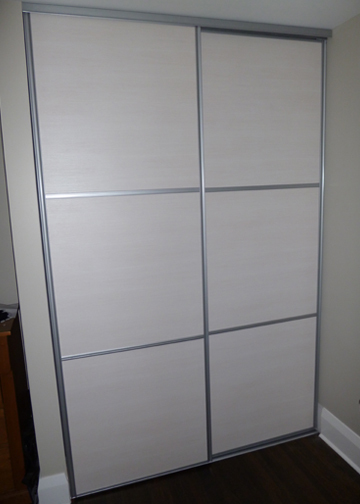 Cover your new reach in closets with a set of sliding doors by Komandor and you will have a highly functional, stylish addition to your living space. In this project, our customer was looking to add some much needed storage to their master bedroom as there was no closet space at all. There was however a large wall with nothing on it. This allowed a Komandor design specialist to design wall to wall cabinetry with a mix of hanging, shelving and drawer storage. 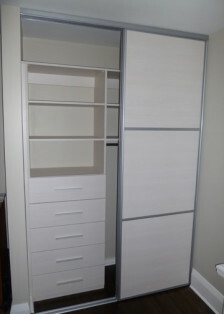 To cover this new reach in closet, the client had the option to either install cabinet doors or sliding doors. Sliding doors were chosen because don’t open out into the room. 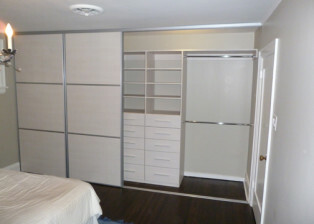 Sliding doors also allow open, easy access to the closet organizer in behind. The beauty of this kind of installation is that we can create a custom closet for you without the construction mess and debris that goes along with the framing and drywalling that would be required in a traditional construction project. The client also had a secondary bedroom. 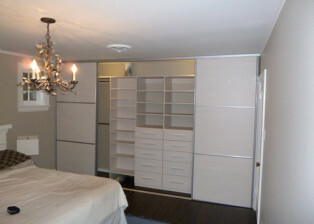 The secondary bedroom had an existing reach in closet that simply needed to be redesigned to improve its functionality. The original sliding doors were worn out as well and needed replacement. For both bedroom projects, the client chose our Woodline Crème finish for the cabinetry elements and used the same finish on the sliding door sets. Please Contact Us if you are interested in our reach in closet systems or would like more information on other Komandor products.